When you watch this video, note the Red Flags (like Love Bombing and Isolating the Victim and making the Victim dependent on the Abuser) which appeared “prior” to the physical abuse starting. This video features Leslie Morgan Steiner, Beverly Gooden, Kit Gruelle, Mildred Muhammad who were Victims of Physical Abuse. They address why they had stayed in the Abusive Relationship. Kudos to these Brave Women for sharing their stories. 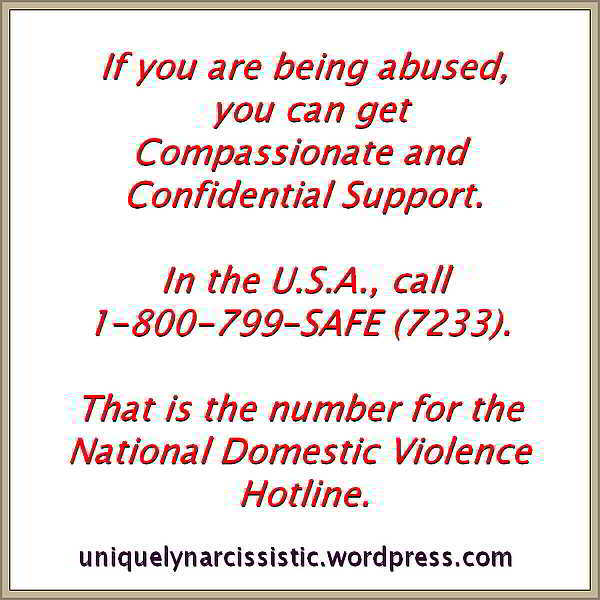 Learn about and then watch for the Red Flags displayed by Disordered Individuals. The more Red Flags displayed, the more questions you should be asking about the individual displaying those Red Flags. Click on this Link to visit the Why We Stayed Twitter page. Click on this line to visit the Kit Gruelle website. Click on this line to visit the Mildred Muhammad website. In this TED Talks presentation Leslie Morgan Steiner explains “Why domestic violence victims don’t leave”. Leslie Morgan Steiner says that she was in “crazy love” — that is, madly in love with a man who routinely abused her and threatened her life. The relationship started out, by the Abuser Love Bombing her. She called it to Seduce and Charm the victim. Her future Abuser Idolized her and she stated that that he “believed” in her. Note that she uses the term “Soul Mate”. Watch for those Red Flags, they may be extremely important to your future health and well being. Next the victim is isolated. She was moved away from her friends and family. About a week before she married her Abuser, he choked her and bashed her head into a wall. When the bruises on her neck cleared, she went ahead and married her Abuser. She got the “I’m sorry” story and that it would never happen again. She did get Abused again, and on a regular basis. Trauma Bonding, in my opinion, kept her in the relationship. Listen to the language which she uses to describe her Abuser. There is something else which kept her in that Abusive Relationship. That was her “Silence” about it. I know that statement may not sit well with some readers. Listen carefully at the end of the video, where Leslie Morgan Steiner clearly states that the end of her Abuse started when she “started talking about it”. Talking about your Abusive Relationship to “everyone” Is the Major Message of this video. No one deserves to be Abused. Abusers program those being Abused “Not to Tell“. When one stays quiet about being Abused, they are giving power over themselves to the Abuser. Abuse is about having power and control over someone. Abusers want those being abused, “to keep their mouths shut”. As soon as one tells others about being abused, their Abuser loses all of his or her power and control. Saying something about being Abused could help to set the Victim free. Click on this Link to read a prior post about a female being turned into a Human Torch because she dared to leave a Disordered Individual. She was burned alive because the guy “didn’t accept being abandoned”. Note also the major Red Flag indicated by the abuse that her Abuser had apparently received from his Step Father from the age of four. Major Trauma suffered by an infant and a young child is IMHO a Major Red Flag that such an individual could be a Disordered Adult. Click on this link to visit the official Leslie Morgan Steiner website. Click on this Link to visit the official Leslie Morgan Steiner Facebook page. Click on this Link to visit Amazon.com to learn more about Leslie Morgan Steiner‘s book titled “Crazy Love”. Will someone miss you? Will someone be there to help you? Do you have family in the same city? What did you do on the weekend? Do you have lots of friends which can provide you with lots of support? This video also has valid suggestions about how to deal with a Narcissist Boss at work. Narcs will leave you alone at work, if they feel that you are not so vulnerable and if they need your skill set. I’ve crossed paths with Narcs very high up the Corporate Ladder and the advice in this video is accurate. Written by Admin Posted in begood4000 YouTube channel, Characteristics of those targeted by Narcissists, How male Narcissists pick their Female Targets, Narcissist targets you, Perfect Target, Turning a new target into a Source of Narcissistic Supply, Who do Narcissists Target?, Why Targets Become Addicted To The Narcissist	Tagged with Being a Target, Characteristics of those targeted by Narcissists, https://www.youtube.com/channel/UCp6mxIkU8I5ODff4PxVKKkw, Narcissist, Narcissist Target, Narcissist targets you, Perfect Target, Uniquely Narcissistic, Who do Narcissists Target? 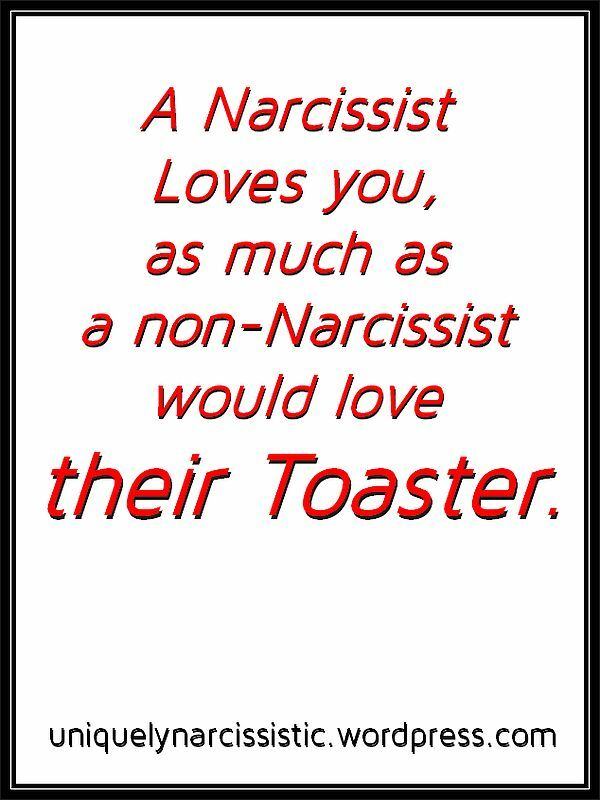 Source: What Makes Someone Chase a Narcissist?